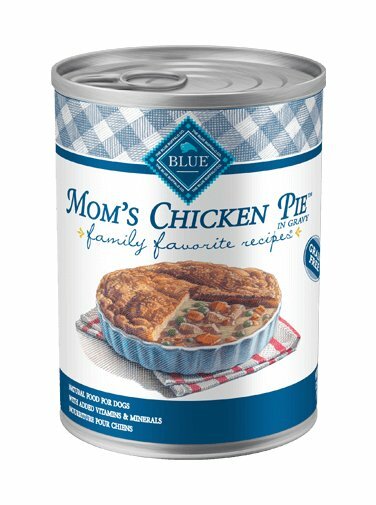 And, like all BLUE dog foods, Mom's Chicken Pie has NO chicken or poultry by-product meals, NO corn, wheat or soy, and NO artificial preservatives, colors or flavors. It’s naturally delicious. Chicken, Chicken Broth, Water, Chicken Liver, Dried Egg Product, Peas, Potatoes, Carrots, Potato Starch, Guar Gum, Sodium Phosphate, Salt, Potassium Chloride, Natural Flavor, Zinc Amino Acid Chelate, Iron Amino Acid Chelate, Choline Chloride, Vitamin E Supplement, Copper Amino Acid Chelate, Manganese Amino Acid Chelate, Sodium Selenite, Thiamine Mononitrate (Vitamin B1), Cobalt Amino Acid Chelate, Niacin Supplement (Vitamin B3), Calcium Pantothenate (Vitamin B5), Vitamin A Supplement, Riboflavin Supplement (Vitamin B2), Biotin (Vitamin B7), Vitamin B12 Supplement, Potassium Iodide, Pyridoxine Hydrochloride (Vitamin B6), Vitamin D3 Supplement, Folic Acid (Vitamin B9).